It is easy to forget quite how unloved London's St Pancras station once was. Today it is due to be officially opened by the Queen after an £800 million refurbishment, but in the early 1960s it was considered by many to be frankly grotesque - a hideous neo-Gothic folly, ridiculously fussy, not to mention grimy and impractical. 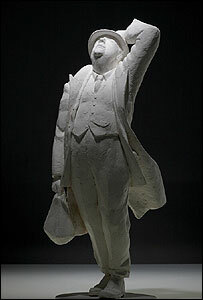 It represented everything mid-20th Century Britain hated about the 19th Century - at once obsolete, pompous and absurd. It was considered a shame that Hitler's bombs had not done more damage. It was time to tear it down and start again, with something sleek and modern and efficient - like Euston Station, just along the road. These were not irrational opinions. Like virtually every other building in London, St Pancras was indeed filthy, its red bricks covered in a layer of soot laid down by decades of exposure to the smoke from the coal fires that powered railway locomotives and heated the capital's homes, offices and factories. St Pancras was also impractical - not so much the station itself, as St Pancras Chambers, designed by George Gilbert Scott and facing the Euston Road. The chambers were built as the luxurious Midland Grand Hotel for the Midland Railway, for which St Pancras acted as its London terminus. But the rooms had no bathrooms and the building's internal walls of load-bearing brick and iron resisted cost-effective conversion. In the 1930s the hotel closed, to become railway offices, and in the subsequent three decades gradually sank into dilapidation. 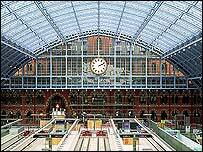 But St Pancras had its champions, chief among them the future poet laureate, John Betjeman. An enthusiast for all things Victorian and Edwardian, and a former architectural journalist, Betjeman could see the place had merits. He helped lead a campaign to save the building, which culminated on 2 November 1967 when St Pancras was listed Grade 1, 10 days before it was due to be demolished and redeveloped as a sports hall and social housing. That was 40 years ago to the month. Four decades in which Britain's railways went into steady decline, the British Rail officials moved out of their offices in St Pancras Chambers, leaving them semi-derelict, and the station itself survived as a quiet haven for pigeons and dossers, the calm interrupted only by an occasional train to Nottingham or Sheffield. The station's refurbishment comes at a time when railways are back in fashion. 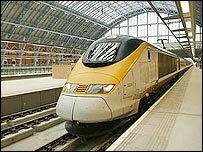 There have been record numbers of travellers in the UK, and Britain now has its first complete high-speed line linking St Pancras with Paris and Brussels - not to mention the rest of the European high-speed rail network. Gilbert Scott's Gothic masterpiece is undergoing separate renovation. It reopens as a hotel in 2009, with its top two floors converted into luxury flats by the Manhattan Loft Co. Behind it the vast train shed completed in 1868 and designed by the Midland Railway's engineer, William Barlow, has been reglazed and its cast-iron girders repainted a fetching sky blue to house the Eurostar trains. To the north a new flat glass canopy has been built to cover separate platforms for Midland Mainline domestic services and a planned new high-speed commuter service into Kent. A second new station has been built deep below ground for the Thameslink cross-London commuter service, replacing the scruffy King's Cross Thameslink station 200 metres away. And a third station has in effect been built by London Underground to improve access to the Circle and Metropolitan line stations under Euston Road. The architect, Alastair Lansley, is a survivor of the old British Rail architect department, where he worked on the rebuilding in the 1980s of Liverpool Street station. There too a grimy, unloved, workaday building was stripped back to reveal a Victorian gem, with glass roofs and decorative cast-iron columns. At Liverpool Street the space thus revealed was promptly filled up again with shops. At St Pancras Lansley and his team have been able to keep the main concourse free of clutter, tucking most of the retail space away downstairs in the "undercroft" below the platforms, along with all the Eurostar check-in facilities and departure lounge. The undercroft is there because Barlow chose to take his tracks on a bridge over the Regent Canal, just to the north, rather than underneath it. That meant raising the platforms on more than 700 cast-iron columns, and filling the space underneath with barrels of beer from the breweries of Burton-on-Trent and with the drayhorses to deliver them to London pubs. Now St Pancras is being promoted as a trendy destination in its own right. We are promised the longest champagne bar in Europe, a regular farmer's market and upmarket shopping. We will have to see whether fashionable Londoners really do flock to William Barlow's restored masterpiece to while away their evenings sipping champagne and watching the long Eurostar trains gliding in and out. But there is no question that the new St Pancras is an impressive gateway to the Continent. And, fittingly, just next to the champagne bar is a memorial to the man without whom St Pancras would long ago have vanished - a statue of the always shambolic John Betjeman, gazing up at that magnificent roof.